Heli-ClearVision, the rotary-wing version of the unique Clearvision™ fixed-wing suite, has been selected by Leonardo Helicopters to be installed on the company’s commercial helicopters. The suite allows helicopter pilots to perform flights in low visibility conditions, previously considered as challenging and risky. The Heli-ClearVision rotary-wing concept includes the Skylens™, Skyvis™ and HeliEVS™ systems. The cutting-edge suite has already been successfully demonstrated onboard various types of helicopter platforms. HeliEVS is based on the certified ClearVision EVS for fixed-wing platforms. The system is packaged in a single line replaceable unit (LRU), installed outside of the helicopter. The high-quality imagery in low visibility conditions is accomplished through real-time image fusion between sensors at multiple spectral bands. Skylens is the ideal display solution for non-helmet users. It is packed in a lightweight, easy-to-install device and is as intuitive as a pair of sunglasses. Operating in low visibility conditions, day and night, Skylens provides head-up information and minimizes dependency on the outside world and on the helipad infrastructure. SkyVis provides helicopter pilots with a conformal “head-up” view, displaying flight, vehicle and navigation symbology for day, night and NVG operation in limited weather conditions. 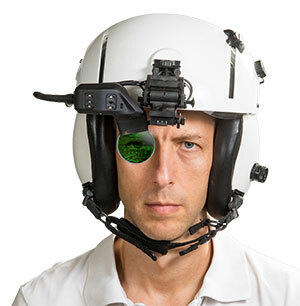 An add-on to the pilot’s own helmet, SkyVis is easily integrated with minimal footprint in the cockpit. Elbit Systems provides cutting-edge electronic avionics systems and advanced cockpit technologies for commercial aviation platforms. Elbit Systems’ vast industry experience, solid partner commitment and world-class solutions are relied upon by leading aerospace companies around the globe. Visit its Press Relations page at http://elbitsystems.com/pr-news-p/ for background materials and information regarding Elbit Systems fields of activity.